Martini received his B.S. in biology, with a specialization in marine biology, from Stanford University in 2014 where he studied the influence of the El Niño Southern Oscillation on the migrations and vertical movements of blue marlin (Makaira nigricans) in the equatorial Pacific south of Hawaii. He is interested in the ecology, behavior, life history, physiology, and diversity of all fish species in both marine and aquatic systems. 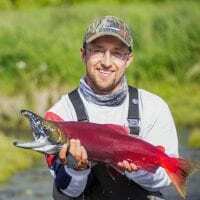 As a Ph.D. student at the University of Washington’s School of Aquatic and Fishery Sciences, Martini’s dissertation is focused on rainbow trout ecotypes in southwest Alaska and the diversity of salmonids in lakes. His other research projects include telemetry of shortbill and Mediterranean spearfish, fish as potential biological control agents of schistosomiasis in Senegal, commercial and recreational fishery management strategies, life history diversity of Kamchatka steelhead, trophic ecology of taimen, Schistocephalus parasite-host interactions, and methodologies in stable isotope analysis. He is an avid angler and pursues his passion for fish both in his work and his recreation. Alex received her B.A. in biology from Pomona College in 2014. 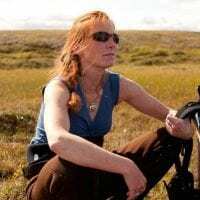 Her broad research interests include the ecology and conservation of freshwater ecosystems, as well as animal behavior and interactions between species (including interactions with humans). As a M.S. student at the University of Washington, she is studying the ecology of brown bear predation on sockeye salmon in southwestern Alaska, including bear foraging decisions, scavenging behavior, and how fisheries harvest impacts bear foraging. In Washington, she has explored the life history of juvenile bull trout and how dam removal on the Elwha River has influenced bull trout occupancy in the Elwha River estuary. Katie received her B.S. in Marine Biology from the University of California, Santa Cruz in 2014. She continued her education at UCSC and received her Master’s in Ecology and Evolutionary Biology in 2016. 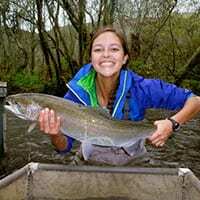 During her Master’s, she studied juvenile Chinook salmon habitat use on the San Joaquin River. She worked with Cramer Fish Sciences to advise the San Joaquin River Restoration Program on strategies for habitat restoration. After falling in love with Alaska during a summer working as an aquarist intern at the Alaska SeaLife Center, she decided to join the Alaska Salmon Program at UW. She is broadly interested in the interfaces of ecology and evolution and fisheries management and conservation. 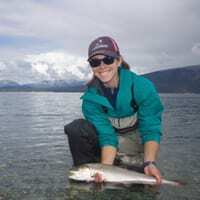 She plans to explore how selective forces interact with each other and the environment to influence sockeye salmon population dynamics and ecology in Bristol Bay, Alaska. I am broadly interested in the genetic basis of trait variation, and specifically how the interplay between selection and drift can influence divergence between populations. I am now an NRC Postdoc at the NOAA Fisheries Northwest Fisheries Science Center working with Dr. Krista Nichols. My research aims at understanding how fish populations respond to changes in climate, exploitation by humans, and disease spread. I am interested in the ecological, physiological, and evolutionary aspects of these responses. To investigate my research questions, I use numerical models in combination with empirical data (e.g. age- and size-structured population models), statistical time-series analysis of large data sets, simulation modeling, state-space models, as well as lab experiments and fieldwork. I have worked on basic and applied issues in both marine and freshwater systems.